South African Music or Recorded Content? July 2001 as amended in September and October 2002. Edited from the text of a talk that David Groucho Marks had planned to deliver at the ICASA / DACST / Music Forum Task Team hearings in Johannesburg on the 10th October 2002. He was in Europe at the time. A PIPE DREAM FOR SOME & SMOKE SCREEN TOO MANY - its Playback Time cries Groucho Marks as he contemplates the ICASA "Position Paper", the recent epidemic of Pop Idols (and a threat of a new series?) & other imported corporate commodities. South African Music (so called local) Content recommendations are biased towards saving the Record Industry & not - as far as we understand its mandate - to develop, transform and create a SAfrican Music Industry. Seize The Airwaves as well? With no music transformation or development programmes in place, the media & the sponsors are jumping in straight to the top...and hardly a SAfrican song or attitude is featured. We have to define what it is we're dealing with here - the recorded product or the creative content? The Bottle or The Wine? The old sport analogy - re transformation and development - is perhaps made in desperation; to help drive the point home? For example. If Mr. Balfour had arranged his commission - into the transformation & development of sport - by suggesting that a handful of corporate experts record a few choice rugby or cricket events & then distribute these recordings to all the broadcasters, instructing them to programme say 30, 40 or even 100% of the content - would this be acceptable to those whose livelihood depended on sport? As players or administrators. Sport, just as with music, does not need a broadcaster or a commercial record company to survive. Of course it all helps when we get to the end product and the A team. But it's the process not the product that's an issue here. How would our teams compete on the playing fields of the world if all they could show for their talent was expensively produced recordings of their best games? What if the Government stopped sport at schools? So now the history teacher with a free lesson is elected as the school's coach because she once hit a ball in High School? Would we be ready to compete in the world of sport if there wasn't some form of educative infrastructure? Music is not that sort of competitive cultural activity; but if we consider the amount of media space, time, energy, education and sponsorship support that is spent on sport via the media (broadcasters), with that of the millions of people that music reaches daily, then it may be easier to understand just how skewed the development and transformation of music is. Besides the product that our top-down record industry & advertising agencies feed us, South Africans know nothing of our hidden history. There are no SAfrican music history & education programmes on radio or TV on over 30 broadcasters - and nothing in the print media - for 45 Million people? We still know more about music in Liverpool and London than we do about Sophiatown and Hillbrow. What's happening here? 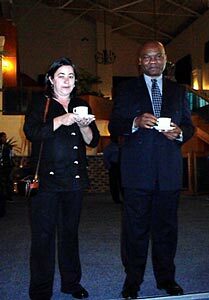 Photo by David Marks - ICASA Councillors Libby Morris and Chairperson Dr Mandla Langa in Durban 2001. A tough ask! The (so called) Local (South African) Content for broadcasters, that is about to become law, is an ill-conceived idea. It will favour only a handful of us professional musicians and the commercial record industry. It will do very little, if anything for the transformation and development of a MUSIC industry. The Record Industry on the other hand deems this (so called) Music content issue - between ICASA, the Musicians and the Broadcasters - as Free & Fair, because we are suddenly a free-market democracy free to chose? The fact that the process has been inherently floored since 1949 seems to have escaped those of us who can turn our music into material and go on exploiting, rather than exploring, our cultural landscapes. Consider this: Approx 250 out of an estimated 500 000 musicians can afford to record their music in any given year. That's 0,05% of the people who make music in SAfrica. What is ICASA's mandate? To protect the record industry by insisting that the broadcasters programme 50% of that 0.05% - or even 100% - or is their mandate to see what they can do to assist, promote and develop the other 99.95%? And where do the civil servants @ the National Public Broadcaster - SABC - fit into all of this? Duty calls? As a Civil Service, beholden to the tax-payer, should the SABC (SAfm in particular) be competing with the newly licensed Top-40 formatted commercial broadcasters at the tax-payers expense? If those Station Masters in radio control of 20 million people cannot tell the difference between assisting musicians and promoting SAfrican music & the production and marketing of the recorded end-product - how can we expect the passengers who've been kept in the dark for 50 years or more, to understand? That light that we so hopefully saw at the end of the A Daze tunnel in 1994, seems to be an on coming one-way commercial train! Where will all this jaw-jaw & the proposed ICASA law-law leave SAfrican musicians? Let them eat Cake or enter SA Pop Idols? Coca Cola, Standard Bank, the Cell industries and TV seem to be very happy. Why would ICASA and those sponsors not consider Music History, Information & Education as part & parcel of our local content? In the light of ICASA's Position Paper, the imported Pop Idols epidemic, the impending SAMA awards (is this a record production or a music event?) & the reluctance by the broadcasters & commercial record labels to commit themselves to transformation & development in South Africa, on their own, I have decided to have one last ditched attempt at trying to attract the attention of future record & music industry role players; because the old farts just don't seem to be listening through all this glossy, expensive and polite thunder. If all else fails, keep (or eat) this document & then when the record industry's major label wheels' finely do come off - as they are starting to do in the USA & UK - you can Please Remember To Remind Me - Never To Forget! The Hidden Years. (If it's retro it must be cool, if it's history it must be boring? - Grieg Coetzee). ICASA and the record industry sites Australia, Canada and France as examples of what an enforced content can do for a local music industry. But they fail to give us the full story. And this I find somewhat deviate. The difference between those societies and our own, is that there is a strong commercial (record industry and broadcasters') roots connection to history, tradition and culture in those communities. It goes back hundreds of years before time and technology as we know them today. The commercial record and broadcast industries may keep on falling apart in the Zeros and Ones column, but whatever happens, music and musicians will survive in those societies. Through their histories - from slavery to the holocaust - there has been a common bond and respect and an understanding between commerce and culture - even if Musicians are seen to be at the bottom end of the human mood chain. That's the way it is in most societies. But that's what gives the contemporary musician, at any time in history, the edge. Revolting rebels' yell and people dance and listen to the genuine sound. The music speaks for itself - provided it gets heard! 5 000 years ago in China when the Mandarins wanted to get a feel of what was going on in their communities on almost any level - from economics and scandal to arts and culture - they would summon the musicians; the troubadours and minstrels. It gave them a good idea of what was happening. Nothing but time and technology has changed. If historians in almost any country wanted an honest reflection of what's happening in the streets today they'd have to listen to the music - whether they liked it or not - or else they wouldn't have a clue. From Jazz, to Rock, Folk 'n Blues. But in South Africa? What would they (and we) learn from Pop Idols and the Commercial Industry re-issues? Maskandi music, Penny Whistle, Marabi, Boere Musiek, we hear is not PC enough? Thank goodness Paul Simon & Manfred Mann didn't think so. All we hear here is that our broadcasters want to get on with life as they know it (through commercial globally imported recorded product?) and they don't want to go back there. Let the past lie they cry. We are searching for the truth somewhere else they claim. Point is, that respect for raw and or polished talent in those foreign cultures - that ICASA insists on holding up as an example of how our broadcasters should operate - is such that working musicians do not need the record and broadcast industries to survive. It's this that we find so difficult to make our own law makers and commercial purse string keepers understand. If the broadcasters' only means of survival is to market and promote commercial recorded product, then that's their business. So be it! But for ICASA to assume that by them doing so - by enforcing a percentage SAfrican recorded content onto the broadcasters - that they and the commercial record industry is all we need to protect, promote and produce SAfrican music and musicians, is a lie. It's a simple as that! Despite the good intentions and hard work of the many ICASA committees, and those who push for programming pre-recorded content at the expense of local music, if these (ICASA) recommendations become law, it will do untold harm to SAfrican music, musicians, arts & culture. But who is really listening? The views expressed in this document are not new. They were presented to the IBA in 1995 (& often to the Record Industry, SAMRO, the various Musicians' Unions (?) & the SABC from as far back as 1971. And that's another story!) However, it seems that one of the (few known) reasons why these issues keep getting avoided, is not because they are not valid - on the contrary. (I am often told by a few New Age executives from within the Record, Broadcast & Music Media Industries, that they are indeed important); it seems to be because musicians are unable to articulate or communicate what needs to be said in a 1000 precise words or less. You have 15 minutes to present your case Marks. A 1000 words in 15 minutes to explain 50 years of cultural genocide and commercial exploitation? I am personally charged (rightly so I suppose), for shooting from the lip and ramblin' on a little....(Oh here's to you, muh ramblin' boy......) Well I say, that if you're listening & bored, look for the exit and if you're reading, the delete button is still only a motion away. Highly skilled (& highly paid?) consultants to the Record Industry & ICASA do not have the time to sift through these long-winded missives we are told. Who of us independent musicians can afford to keep up with the debates & talk shops? That is not our job. Time for talking is over - it's Play back time! Without a Yesterday there can be no tomorrow - Zolani Mkiva. Quote - Michael Markovitz: Given the enormity of our (ICASA) mandate, there has been some concern by both the broadcasting and music industries that their issues will be swamped by the largely economic, strategic and technical concerns of the telecommunications industry. We should not allow this to happen. But neither should the industry. Often regulatory agencies are as effective as the legitimate pressure that is placed upon them by industry bodies and interest groups. Well said.now where is this "music industry" that Markovitz speaks of? What follows is a response (diatribe?) to Michael Markovitz paper on (so called) local content. Nothing personal against him or any individual in the record industry, at the SABC or within ICASA. Their good intentions are appreciated, But the ICASA Position Paper ignores the overall dynamics. We can't blame the past & keep referring to the Big A Daze forever; everybody understands that much; but without acknowledging the past - our hidden history - and the corporate pillaging that has gone a long way to distort & destroy much of this country's colourful cultural heritage - we will forever be doomed for repetition. And it is happening! SAfrican Music Content recommendations by ICASA are biased towards saving the Record Industry & not - as the mandate stipulates - to create a South African Music Industry. Michael Markovitz,the special Advisor to the ICASA Chairperson and Dr Mandla Langa are men of great integrity and experience; but if they and our broadcasters cannot understand / acknowledge, that there is a difference between a non-existent (or extremely fractured) local music industry & the well established top-heavy commercialrecord industry, how then are those politicians who are framing these laws (for our protection they claim?) & the listeners who are being led to the mass market product bizarre, be expected to see the bigger picture? The assumption that ICASA and the media seem to make (see Lloyd Coutts' response in The Sunday Tribune Business Report) is that by association (in any normal society?) the record industry is part & parcel of the music industry; management, copyright, agencies, instrument makers; from venue owners & tour operators to the Departments of Education, Labour, Tourism, Trade & Industry and so on. However, the (so called) music industry in SAfrica exists - if it exists at all - on paper only; trapped in a multi-cultural vacuum. And according to the commercial record and broadcast industries, it seems that those of us who still (foolishly?) believe in the magic and muse of music, love, peace and harmony, are the suckers. The broader commercial industry's main intention is to hold on tight in this vacuum for as long as they can; to make a quick killing and satisfy the demands of their shareholders and to take the quickest and most cost-effective route to a viable bottom line, at all costs. Yours & mine? Making a profit out of music is no crime. But what about exploitation? It's been part of the record industry's vocabulary for 50 years: by their own admission and by definition, their job is to exploit music. What about exploring it a little? They have spent the best part of 50 odd years investing in the Bottle and not The Wine. If only those 250 odd musicians (0.05% of the professionals who can afford to record & release CDs), are actively involved in this (so called) local South African content process, what will happen to the other 500,000 (99.95% of SAfrica's musicians)? Will they remain alienated and become more frustrated and bitter from this (so called) local content process? As things stand now, that's what's happening. Many musicians have assumed the entitlement approach, leaning on the old A Daze and claiming that the government, the broadcast and commercial record industries, owes them a living. And unfortunately it sounds like it! But there is hope. Time and technology, as always, are both on the side of the creative musician who is prepared to work and the music lover who listens. If ICASA and the broadcasters can play a constructive role. With the technology available, the commercial record industry is understandably worried and desperate - they have very little time; despite their hidden fortunes and consistent pleas of poverty. But whose fault is it? What we have here in South Africa is an extremely pale-male top heavy over-indulgent record & broadcast industry that took full financial advantage of apartheid & the cultural boycott at our expense. Of course the jury will be forever out on whether they did this intentionally or not, but the point, whatever happened in the A Daze, is that the commercial record and broadcast industries had a wonderful opportunity to redeem themselves in 1994. They didn't! Together with their shop-front window to the mass markets out there (the SABC), they continued to promote their own selective tastes, morality & self interests & where necessary turned a deaf ear to the pillaging of our intellectual property and creative resources. (See Rian Malan's Story of Music / Where Does The Lion Sleep Tonight >>). South Africa back then was an easy target market for any Top-40 format; and it remains so to this day. We have no choice as things now stand. (And as grateful as we may be to the Record Industry for distributing all those wonderful local & imported recordings - it certainly changed my life among many - musicians today feel more cheated than ever. We can't always put our fingers on it. Personally I feel that one of the misfortunes in us trying to fulfil our own content ideals (and this should not be used as an excuse in the way that many young musicians and entitlement holders are now doing) is that we were not allowed by law & the so called market driven economy, to freely express ourselves and experience or associate with music & musicians from other indigenous cultures. Too true, some of us did. But at what cost? Isolated by the SABC and constantly told by the commercial record industry that we will not be considered for selection if we dabble in politics or protest? Throwing up the past, rapping up the present and reinventing the future? As Jeremy Taylor says: It's one thing remembering the past, but living in it is another one altogether. 3rd Ear Music would like to add, that reinventing the past is yet another calamity that we have to face, head on. The commercial retro record industry believes that by re-issuing those old (often horrendously produced recordings) of some great South African alternative bands - that these marginal self-censored rebels who said one thing on stage and another on record - will indeed contribute to our lost and hidden heritage. And the SABC (and ICASA??) are buying this? Of course they were part of our history - but I'm not the one who's being selective here. And yes of course I'm pushing for The Hidden Years Music Archive Project to be part of this process, even if, as you can see from our website, we were only a tiny sliver of the iceberg that the current mainstream broadcasters seem unaware of. We, the HYMAProject, are not on a Witch hunt. We are not, as some of those old civil servants assume - pushing for a music TRC. What we are saying, is that if they don't do something to avoid what's happening below the current, we'll all go down. That's all! If the Independent Communications Authority of South Africa (ICASA) is required by law to promote South African music content, then we must insist that the law take it's course- and that course is not the easy route down the murky imported pre-recorded mainstream. It means getting ones feet and nose wet. We have a record industry with a proud record (excuse the pun); we grew up on & looked up to EMI and TEAL and RPM and GALLO - recording, marketing, distributing & promoting some wonderful recorded product for us to enjoy - local & international. We at 3rd Ear Music - in the Master Jack days - were naively proud of this industry, because it was way ahead of its time in the integration stakes. Gallo Africa for example, has become an industrial legend on the continent. But not as a music company - where musicians are trained & encouraged, educated & marketed - No! It's not their business they say. It may be true that the commercial record industry broke every business monopoly-act in the statute book (it still does I hear) & that millions in musicians' royalties went missing over the years - but generally it was a truly colour-blind interracial multi-cultural industry. It's true to say that it was the racist politics of the white supremacists that threw many musicians together - music people who would not normally have associated. Township Jazz and City Folk musicians, Country bums and underground Rockers all got together at 3rd Ear Music / SAFMA / NUSAS Free Peoples Concerts, Clubs and Coffee bars. That's not happening today. The civil servants at the SABC - many who are still there, and who are desperately holding onto their golden handshakes - made certain that musicians who stepped out of line, on record at any rate, would remain unheard. If we wanted to make some sort of a living out of radio, we had to shut up, or else the recorded music mysteriously did not fit the format. And very little has changed, I might add. On the other extreme, musicians had to leave the country or be a little more creative in the 60's, 70's and early 80's. Those who stayed to face the music had to get fairly inventive to survive. Is this the experience that so many SAfrican musicians took with them into exile to rule in the USA, European and UK industries? 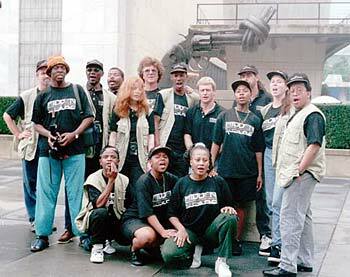 3rd Ear Music could fill culturally mixed (illegal) concerts, clubs and festival gatherings, without a minute's airplay and no media support to speak of, for almost 20 years. A little word-of-mouth, the old Xerox Roneo machine and some wall-paper paste for the midnight poster raids on flyovers, police stations and suburban walls, is all we needed to be heard. SAfricans in London & New York still rule many aspects of the foreign record & music industries; here at home we have an unprecedented amount of independent labels & online music & record services run purely on passion & patriotism, without so much as a penny passing from the record industry into this grass-roots and street level development. Does this not speak volumes about an industry that claims, through recorded local content, to represent the interests of music & musicians of this country? SAfricans have become champions of the world - including music - with no thanks to the record & broadcast industries who have offered no assistance other than to supply the finished product. The SAfrican record industry for all its resources, major awards & self-proclaimed involvement in music have failed to export one locally written, recorded & produced international hit song or band in 35 years. How many musicians can actually earn a living from the sale of their records in this country? Feed the family and pay the rent? I would say 5. Maybe 10. And even if that figure were 200, does this give the record industry the right to call ICASA's tune for an enforced recorded local content on behalf of all musicians? Given our recent history, who but a few of the better-informed music fanatics & purists would be any the wiser, as to what happened then and what's happening now? And why? The (so called) progressive, loud and abusive Desk Jocks who claim they hate music and musicians, scream: enough of the past already! It's only the future we care about. And once again, it sounds like it! If they don't know where we come from they sure as hell won't know where to go. And if there is one art-form that needs roots and tradition to survive and catch the people's imaginations and hearts, it's contemporary music. Music of any kind of music I suppose. That's life. Listen to what happens to the people's music in the USA - from country, rock 'n roll, rap and jazz? But not in South Africa. Here we have a top-down studio invented cash-cow like Kwaito that may be fun, but in no way does this represent the youth and community in this country. That's why it's dying. But it made the industry a lot of money. Every new generation of musician in most countries can discuss their roots & traditions with great pride, ad infinitum. The devastation of Slavery & the Holocaust are part of a musician's reflective spirit, tradition & roots in the USA and Europe. The world sings & dances to their tunes and humankind will never forget; there are no preaching or expectations; not too much whining and moaning outside of the blues. A good musician's mission in life is to shine a little light in the dark, regardless of the perceived financial perspectives or political consequences. Those good musicians come to the top with the cream. 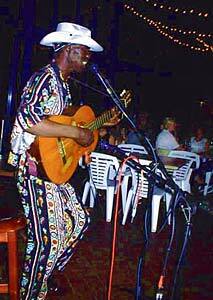 SAfricans have just as much right to write, sing & dance about their lives as anybody. But what do we offer the world - the SAMA & KORA awards & SA Pop Idols? The world already has the Grammies - they don't need us to export the same boring event. What can we offer the world from the annals of our own history - as ICASA & South African Music Content now stands - without whining & claiming victim status forever? 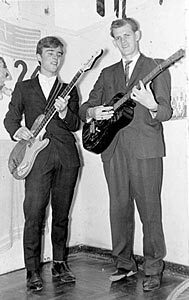 David Marks & Tom Dooley - St Helena Gold - Mines Hostel 1963 - (P)© Photo by Ian Bubb (Uk). Many township and inner-city community initiatives were destroyed by the commercial record industry, just because they were not considered cost-effective, as are the easy ready-made imports. However, with no airtime Marabi is still the accepted sound of Township Jazz as is the Penny Whistle of Urban South Africa and iSicathimeyia in the migrant mine hostels. The Maskandi guitar and concertina still rings out in the hills of kwaZulu Natal as does the Boere Musiek piano accordion of Mpumalanga, no matter what those loud and rootless hip DJs may say. And this people's music is generally avoided and ignored by the mainstream broadcasters and record industry despite the commercial and export and local tourist potential. Why? Besides being considered as non-cost-effective, they are totally un-hip and non-PC to a handful of radio controlled power freaks, button pushers and bean counters. It's not what our listeners what to see hear??? What is ICASA doing to fulfil their mandate & legal obligations to promote SAfrican Music? Instead of the new democratic broadcast system and 50% local SAfrican content working for music and musician, exactly the opposite has been happening since 1995. As one Zulu attorney sadly put it to me: I am now fighting my own Radio commandos for 50% of what the white racists gave me 100% of! And the so-called Black Ethnic (ex Radio Bantu) stations are not alone. Eurocentric orchestras have closed down, theatres are dark & music education at schools in all 11 official languages, plus one, (for programmers & record industry personnel as well as listeners) is non-existent. Because it is not financially viable - they say? There is hardly a note of indigenous music - traditional or contemporary - to be heard in any hotel or club in any tourist city outside of Capetown. Imagine going to Greece or Mali & not hearing one local song? Play Live to Survive -It's the only way out for music and musician. The Broadcasters are right - if we force people to listen to what they do not know, they are going to turn off, not on. However, if those many millions did have a choice or a voice, will we (the people) remain the targets for the very same exploitation that we've been subjected to in the past? Somehow - given how well they have accepted the transformation and development of sport - I don't think so. If those who could afford it, were encouraged to attend concerts, rather than simply buy CDs or DVDs, they would soon make up their own minds. Is this what the broadcasters, record companies and market researchers are afraid of? The truth! The only difference between the truths then and now, is that local content is no longer about political expediency, but for the benefit & pockets of a few faceless board-room executives & their unaccountable shareholders! SAfm- the taxpayers National (so called) English Public Broadcaster now openly competes with independent pop stations for a piece of the mainstream industry's music pie to survive. Will forcing SAfm to programme a percentage of pre-recorded commercial music product make our cultural dilemma disappear? If ICASA cannot hear what's coming - in terms of how musicians are being misled and exploited - then in the absence of any other logical explanation, I must go down saying that somebody, somewhere, is in the commercial record industry's pocket. What other conclusion for these obvious omissions can we come too? (We have this bizarre situation with East Coast Radio here on the East Coast of kwaZulu Natal; they will gladly advertise a community event but they cannot play the music! Why? Because it's not what our listeners want to hear. Malan & Adolph would have been proud of them. If we weren't subjected to this form of logic and thinking for the past 50 years - Radio 5, Radio Port Natal etc - it would be very funny). ICASA's reluctance to encourage broadcasters & the record industry to get involved with music education, history and performance is a mystery.The once proud racially integrated record industry could have easily taken a cue from the conservative sport industry who, incidentally were also snookered between a rock & a hard place - politics, economics, development, transformation - in 1994. Somebody's going to have to pay. What we need to do!But wheredoes the money to do it come from? If the ICASA through the record industry could encourage the SABC to make contact with musicians at grass roots & street level outside of these persistent ethnic compartments that were created from those (default) foundations laid down in the A Daze, a true SAfricanism may eventually emerge. Naturally. Freeing of the airwaves is essential.Communities should be free to set up their own broadcasters, from suburb to township, from squatter camp to rural farms, from hostels to hotels, with one major provision: that they network; a process of sorts from community, regional, provisional and national. Free from forced content, commercial record industry interference, collusion and big brother government spoiling tactics. Given the times and the technology and the relative cost-effectiveness of setting up a radio station, this is not as impossible or as far out as it sounds. Broadcasters' licenses for existing commercial radio and SAfm should only be granted if they include some hours a week for education, history, live performance, interviews, general information etc - publishing, marketing, manufacturing, piracy & the new digital technology, how this will affect the industry etc; the sort of information that our revolutionary leaders with struggle credentials would understand and that the commercial record industry thought was privileged information for 50 years. Broadcasters can find sponsors & money - enter into deals, detail & partnerships - just as the sport industry has done through their sponsors & media. I'm not suggesting re-education camps for comrades or boring lectures - programmes from the bottom up eventually do become entertaining; this should all form part of the Music Content criteria. With the (approx) R400,000,000 VAT bill the record industry pays to the Government & the profit from the product they advertise for free on 30 radio stations to 20 million listeners daily, there should be enough funds to assist every school and community in the country. Needle Time-Every other product provider on radio & TV pays to advertise their wares; but the record industry wants the Broadcasters to pay them for advertising??? The commercial record labels get over 200 free adverts on over 25 broadcasters daily & still they are reluctant to get involved with education, history, live performance, transformation & development - & now they want to be paid for play? For young aspiring musicians -Young people & their parents do not know that there is a process - or that there should be. It is their constitutional right! Let's look at sport (again!). Through the mass media people have learnt to understand the transformation and development process - more-or-less - in sport. We no longer simply throw our children into the Olympic ring no matter what good street fighters they may be, without some form of support system or infrastructure. It is irresponsible, we are told. Physical training & mental preparation need to be considered when dealing with a child's future, fortune or fame in a country used as a political football and a cultural dumping ground for so long. Where only the polished pre-recorded end product is considered worthy of presentation. The SARIE, SAMA, KORA awards for example? So what we see / hear, courtesy of the New Democratic (?) Broadcaster is the perfect 10 good-looking studio produced vocal gymnasts & crotch-grabbing aerobic instrumentalists. And what do they gain from it? A bigger audience, a wider bottom line, few more wealthy record & advertising executives & a bunch of disappointed soon-to-be-forgotten wanna-bees, begging or busking in the streets in 5 years time? 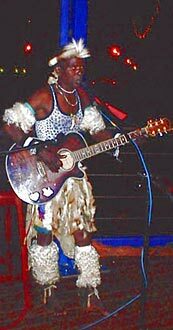 Pop musicians in SAfrica have become poor inexpensive good-looking dispensable copycats. But who cares? The ratings & royalties have gone up and that's good enough for the DACST, the SABC and ICASA? People should be free to choose true - but to do so we need fair & equal access - to resources & information. Only then can the Bored Room mainstream driven market executives claim parity from behind the constitution, the (so called) free market system, freedom of speech & all that jazz. Are we ready? It's the Musicians who live & work in a highly abnormal context within this society - musicians by law are still classified as vagrants - so the mainstream market research & media polls (to see what our listeners want to hear here?) smacks a little like those political pronouncements on Aids & Mugabe; plastered together to keep the natives happy or at arms-length, by highly qualified, respected (and well paid) consultants. It's not rigged it's all free 'n fair I tell you! Sure, we had those many democratic ICASA, IBA and DACST hearings - the musicians lined up to express their free-will and view. I was one. But what happened prior to the run up to these elections...starting in 1949? Cultural genocide isn't even apt anymore. And that's why ICASA won't listen. Do they honestly believe that they are doing us - the people and the musicians - a favour? I hope not! Whatever the record and broadcast industries market research & polls show, the process has been inherently flawed for over 50 years; in no way can the broadcasters and the commercial record industry be deemed equal, free & fair in this country, at this time. We have been force-fed courtesy of the SABC & the commercial record industry for far too long to make informed and wise choices. The dissenters & objectors who dare to finger corruption, nepotism & self-interest - within the advertising, record & broadcast industries - are ignored or ridiculed by the very powers that these industries have been free to wield since the A Daze of Verwoed and Vorster. Dissenters are forced to dodge the same racist & reactionary barbs that we had to duck & dive from, when the swart-gevaar & communist insults were being hurled around. And the media only jumps to conclusions in this debate if it's going to improve sales, move units & attract sponsors - for the advertising, record & broadcast industries. Having said and done all that, your music will most definitely not-fit-the-format! When it suits the suits in the media - and those in broadcast and record companies - they will (secretly and confidentially) confide in you that their target markets are dumb short-attention spanners who deserve the junk they are being told and sold. However, if you do so manage to get through to those poor dumb mass target markets - beware! You will be accused of being patronizing. As the messenger, you'll be dead and buried as surely as the Security Police closed down Roger Lucey's career. The methods may have changed, but somehow, Corporate Censorshipand Bored-Room decisions today, seem a lot more sinister. In the A Daze at least we (sometimes) knew whose tyres to deflate or on which roof the midnight bricks would land. Now you are warmly greeted by a comfortably numb smile in sweet democracy. Sorry, but your music does not fit our format! 3rd Ear Music believes that the broadcasters & their sponsors have an obligation to the musicians & the people of this country - to transform & develop a music industry, not prop up the top heavy record industry that is about to fall on hard times - maybe sooner rather than later.With today's digital & cyber space technology an over capitalized commercial label has to sell hundreds of thousands of CDs to survive; whereas with that very same technology a good musician, without any broadcast time or airplay, can feed & clothe a family by selling 50 CDs a month. The decline of those top-heavy record industry monsters in the USA & Europe is imminent, but that's their problem, why make it be ours? The good musicians in those societies & cultures will survive because there is a strong foundation; there's a connection between the record & the music industries. Musicians, technicians, promoters, agents, venues & events have no such associations in this country outside of our usual master servant madam slave relationships. The only difference now, is that it's not exclusively white anymore. Except ofcourse within the commercial record industry and the few Coconuts they employ. About 5 000 people are employed in SAfrica's billion Rand record industry - not one of them is a professional fulltime musician. 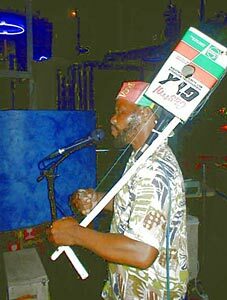 How many record & advertising executives, TV producers, DJ's & music media hacks who are paid to call the tune & pay the piper in this country, have had an opportunity to trudge the streets performing to the people? It's too late now. But couldn't they learn from those who did? We do not deserve Pop Idols. South African music is far better than it looks & sounds - but who is really listening? The DJs? 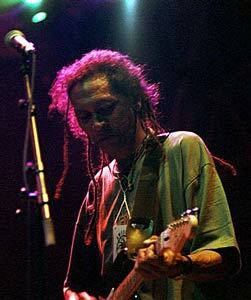 Steve Fataar - Hidden Years Music Legend in Durban 2002. (p)© Photo Shane Fataar. As far as I can tell, there is no pro-musician, record industry suit, broadcast programmer or employee under 40 that can tell us anything about our music - past & current - outside of what they have heard on the SABC or are being force-fed by the commercial recording industry. Because they have no choice? Our music broadcasters, like our sports broadcasters, should not only learn to play the game, but help us level the playing fields as well & then make an effort to attend the games & the practices. Within this local content criteria they could be given incentives to do a bit of homework - past, present & future. How can RISA and their sponsors - who speak for a billion Rand record industry - representing no more than 0.05% of the people who make music in this country & the 5 000 who can afford to rule - claim on one level to represent a music industry, when it suits them - through SAMA, Pop Idols, KORA - but on another claim that it's not their business to provide the infrastructure needed to sustain the content that fills those platforms? What does Standard Bank think about all this? They dropped an established international development event - the Grahamstown National Arts Festival- to become part of this? Would they help the communities of this country set up independent Radio Stations - in suburbs, townships, farms and cities? The Bottle or the Wine? You choose? Cheers! 3rd Ear Music Company est. 1969 (Pty)Ltd.
3rd Ear Music (Pty) Ltd reg: 89/06695/07 Est. 1969 - The Contents of this Letter/Fax/eMail do not constitute a contract & the views expressed herein are not necessarily those of 3rd Ear Musicians & Funders. If you have any comments about this article, please drop us a line.